Renshaw remained unbeaten on 90 off 50 balls. The Brisbane Heat have suddenly come into the contention for the knockout stages in the ongoing Big Bash League (BBL). They defeated the defending champions Adelaide Strikers and have almost knocked them out of the tournament now. Though even the Strikers are in the contention but for that to happen, the Melbourne Stars who are currently playing against the Perth Scorchers should all their remaining matches including the ongoing one. 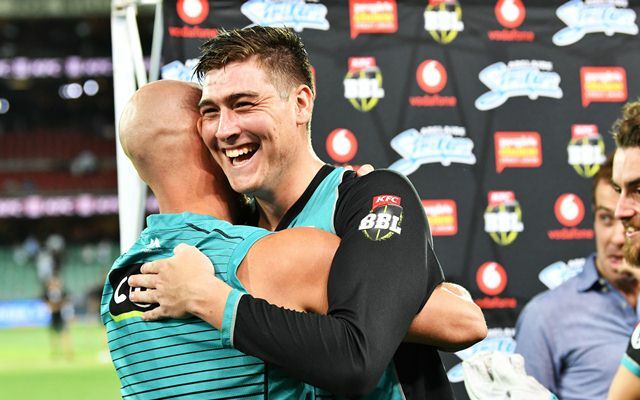 Even the Heat will need a favour from the Scorchers as Chris Lynn and his men will be facing the Stars in their last league game. After opting to bowl first, the Brisbane Heat started superbly by picking up a couple of quick wickets to leave the Strikers reeling at 5/2. But middling and crucial contributions right down the order helped them post a competitive total on the board. Jonathan Wells was the highest run-getter for them and he scored 30 runs while Rashid Khan and Cameron Valente gave the final push to the innings which propelled them to 176/4 after 20 overs. Josh Lalor was the best bowler for the Heat as he ended with the figures of3/25 from his four overs. The other bowlers also chipped in with crucial wickets at regular intervals. Even the Brisbane Heat got off to a terrible start as Ben Cutting and the skipper Lynn were sent back within the first eight deliveries of the chase to leave the team at 7/2. Even Max Bryant was snaffled by Peter Siddle then to make it 18/3 in the third over. Matt Renshaw and Brendon McCullum joined hands from there on and took the attack to the opposition. The duo added 122 runs for the fourth wicket in just 72 balls to put the team in a dominant position. McCullum played one of his best knocks of the season while Renshaw finally lived up to all the promise. Rashid increased the hopes of his team by pinning McCullum in front of the stumps but Renshaw didn’t allow the Strikers to make a comeback in the game. He remained unbeaten on 90 off just 50 balls while McCullum scored 51 off 39 balls as the chase was sealed in the 19th over itself. Alex Ross also played his part scoring 25 off just 13 balls as the Heat climbed to the fifth putting the Sydney Thunder behind them. This is one of the most random T20 knocks of all time.